An eco-tourism program jointly shepherded by a major conglomerate and the leadership of a Local Government Unit (LGU) to transform mangrove cutters into fisherfolk and illegal fishermen into tourist boat guides, recently captured the imagination of judges of an annual search for outstanding local government programs. • The far-flung municipality of Del Carmen in Siargao, Surigao Del Norte bagged a Galing Pook Award for the Siargao It Up! Mangrove Management and Social Tourism Program. Town mayor Alfredo M. Coro II (Seen here) received the award for the program, which he said creatively uses tourism to fight poverty in Del Carmen. • “Siargao It Up! 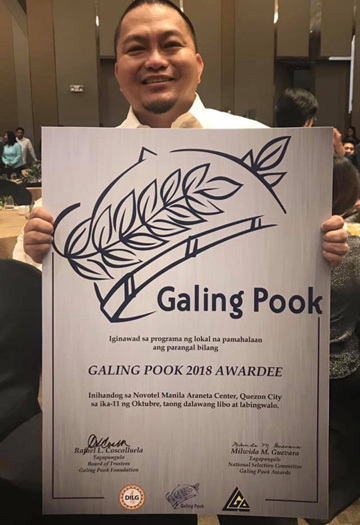 was among the 10 winners of the nationwide 2018 Gawad Galing Pook. • The Galing Pook program selects the best practices of LGUs and shares information on these beneficial programs for replication. • The awards have cited some 319 programs from at least 200 LGUs over the years, including this year’s winners who are picked by judges based on the impact and positive results the projects have brought to communities, their empowerment of people, the project’s transferability and sustainability, innovation and the efficiency of its service delivery. The Metro Pacific Investment Corporation (MPIC), has been a partner of Coro’s government and local community leaders, to protect and preserve the municipality’s mangrove forests since 2010. MPIC’s assistance involved the establishment of the Mangrove Protection and Information Center, a venue that helps people know and experience the importance and benefits of mangroves in terms of biodiversity and its contribution to the safety of the coastal communities. “We would like to thank MPIC and of course, chairman Manny V. Pangilinan, for partnering with the municipality of Del Carmen to create a new understanding and appreciation of the eco-tourism in the mangrove forest and in Siargao Islands,” Coro said, upon accepting the award from Vice President Leni Robredo, the keynote speaker of this year’s Galing Pook Awards. “The Del Carmen Mangrove Forest is our source of food, livelihood and protection from natural disasters—is also a critical ecosystem that supports the fish stocks of Surigao del Norte, Surigao del Sur, Bohol, and Cebu,” Coro explained. The town chief executive assured this year’s Galing Pook judges that the award will serve to “increase the credibility” of Public-Private Partnerships such as Siargao It Up!, and pave the way for potentially new partners to help communities like Del Carmen build an ecosystem-based growth and development. “It is with great honor and privilege to have the support of MVP and MPIC, as we move towards preserving the environment and the people that serves to protect the environment of Del Carmen and Siargao Islands,” he declared. Now on its 10th year, MPIC’s Shore It Up! (SIU) program continues to expand its partnership with institutions, foundations, organizations, civic groups and scuba diving teams who help restore and revive the coastal environments of various provinces all over the country. SIU’s partner venues today include coastal municipalities in Alaminos, Pangasinan; Mabini, Batangas; Puerto Galera, Oriental Mindoro; Cordova, Cebu; Medina, Misamis Oriental; and of course, Del Carmen, Siargao in Surigao Del Norte. “Shore It Up undertakes environmental issues in a holistic manner,” explained Metro Pacific Investment Foundation (MPIF) president Melody Del Rosario. “We believe that for our environmental ecosystem to work, various marine and coastal support must be sustained with livelihood programs and proper education on environmental awareness,” she said.